There’s been no shortage of information released about the effects—or lack thereof—of artificial sweeteners. The trouble seems to be finding anything of substance. There appear to be more conflicting results about their potential health effects than the products they’re added to! But let’s get real here: if you’re making an effort to use artificial sweeteners like aspartame, sucralose, or stevia, it’s probably because you’re hoping for some sort of slimming effect. And according to new data, you’re likely not getting the benefit you hoped for. Artificial sweeteners are hiding in so many products you might be taken aback. Traditionally used as sugar alternatives to sweeten sodas and coffee, aspartame, sucralose, stevia, and more are widely used in chewing gum, yogurt, granola bars, whey protein powder, mayonnaise, and many other no- or low-calorie food options. And when eating foods low in calories, people tend to think they’re safe from the dangers of high-calorie foods—dangers that include high blood pressure, obesity, high cholesterol, heart disease, and diabetes. But there’s one problem: these beliefs don’t always translate into reality. 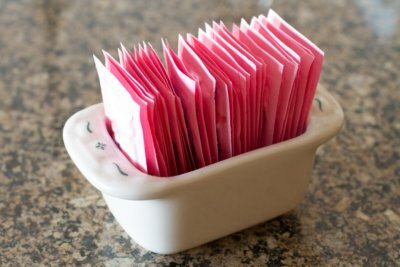 A new meta-analysis published in the Canadian Medical Association Journal (CMAJ) established two things: the health effects of artificial sweeteners have not been well studied, and potential metabolic benefits seem to be non-existent. In fact, these sweeteners are likely doing the opposite of what you think they are. They may be associated with long-term increased risk for obesity, heart disease, diabetes, and high blood pressure. It’s possible that these sweeteners mess with gut bacteria and appetite, potentially boosting the overall volume of food consumed. So, for example, if you’re consuming a diet soda alongside a cheeseburger and French fries, you’re really not easing the health burden of such a meal (when consumed repeatedly). Sweetness causes the brain to produce more hunger signals. By tricking the brain and providing sweetness without the calories, however, artificial sweeteners may trigger cravings for more sweet foods and drinks, increasing overall calorie consumption. If you do occasionally use nonnutritive or artificial sweeteners and stick to a relatively healthy diet that’s low in processed foods the majority of the time, you likely have very little to worry about. I’m guilty of using them to add a little flavor to my water a few times per week and am not seeing any upward movement on the scale! I think that if you’re regularly eating a variety of healthy, unprocessed foods that promote a strong population of gut bacteria and are shown to lower the risk for the conditions outlined above—so think plenty of fruit, veggies, whole grains—you should be okay! Just don’t think these sweeteners are either good for you or capable of eliminating the risk of chronic illness. “Artificial sweeteners linked to risk of weight gain, heart disease and other health issues,” ScienceDaily, July 17, 2017; https://www.sciencedaily.com/releases/2017/07/170717091043.htm, last accessed July 19, 2017.